The things you have to do to keep Jennifer Aniston entertained. By now, you'd think John Mayer would have enough of his own hits to fill out a set. But on his current tour, the singer-guitarist has been surprising audiences with a fair amount of covers, such as a mellow take on the blues standard Crossroads and a spirited version of Tom Petty's Free Fallin'. 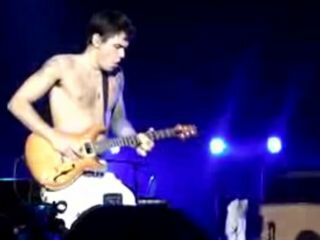 Nothing, however, could have prepared us for Mayer, shirtless (the better to show off the tats) and leaping about like a 16-year-old, busting out a stone-cold rendition of Van Halen's Panama. Singer David Ryan Harris, who performs with Mayer's band, handles the David Lee duties, while Mayer makes like Eddie - hammer-ons and everything. Curious? Of course you are. Here's the video.